Some Things Are Too Mean To Die. After the Agency executed Omega Protocol, Subterra Bravo was nothing but a smouldering crater. We thought there were no survivors. We were wrong. Dr. Cronos is at large. A new team of Agency commandos, call sign Tin Man, has tracked the rogue alien to a secret research facility in Russia. Their mission: exterminate. Meanwhile, Cronos has revived Russian experiments incorporating Ghin technology stolen years earlier by Soviet-era spies. In his new Russian collaborators he has found the means to protect - and advance - his nefarious research. And this time, Cronos is ready for a fight. To reach him, the commandos will first have to go through his army of Spetznaz and confront a new genetically engineered nightmare. But Tin Man has a hulking mech suit bristling with weapons and high-tech capabilities, as well as an unlikely ally in Thoth, a Ghin scientist with powerful psychotronic abilities and the sworn enemy of Dr. Cronos. 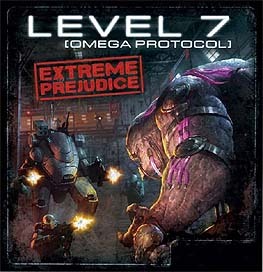 Extreme Prejudice is an adrenaline-fuelled expansion for LEVEL 7 [OMEGA PROTOCOL]. a semi-cooperative board game of miniatures-based tactical combat for 2-6 players. Continue the hunt for Dr. Cronos with five new scenarios, three new enemy types, and two new commandos - a sophisticated mech suit pilot and a dangerous new Ghin ally.